Once I was a man of few words even if behind it my mind was feverish. Not many moments of calm, though I learned to keep quiet. 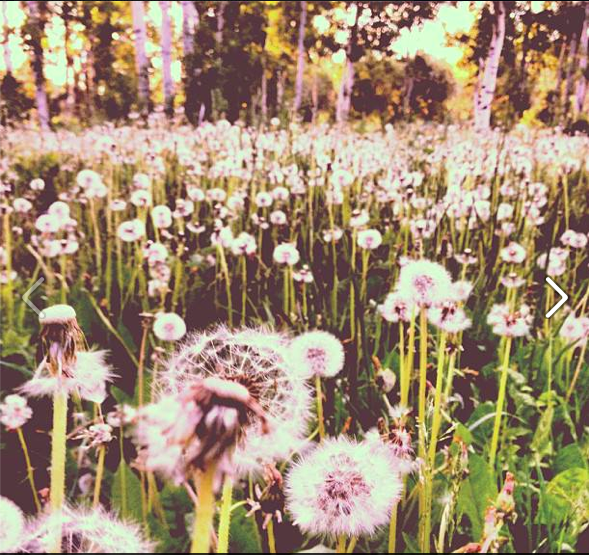 I lived in a room overlooking the pier and a field of dandelions. The dandelion spoke the advantages of taking root as well as flying and how to slip with ease into reveries about living anywhere, a flat above Montparnasse Station in Paris with a splendid panorama over domes, spires, and rotundas, over the spread of rooftops disappearing into a vast distance, spiralling down unnoticed onto innumerable streets and railway lines or in through the open window of a small attic room in London with a view on the hustle and bustle of a street market before falling into that landscape of crowds among the cries of hawkers and stalls spread with colour. It is wonderful to find yourself in the Luxembourg Gardens, out for a stroll on a splendid, divine, Spring morning, around and around, on the way home, I crossed St. Patrick’s Bridge where a beggar sat against the cold buttress. Have you a few copper coins? His face was veiled by mist from the river. When I leaned in to get a closer look, I saw yellow pus seeping from his eyes. I stood into a bar and ordered soup and wine. Something in the air, a smell or a word wandering astray, there was no-one else there but a young man at a table, talking to himself, maybe it was a distant sound, a chime, a glass breaking in a far off room, a door closing in the almost deserted mall outside the bar, induced in me a strange feeling that I was once more elsewhere and not stranded on this little island. I paid for the soup and the wine. I pulled the small change from my pocket and spread it on the table, stood for a moment without moving as the lights went off. I walked into the streets around the station. I saw a bar still open, then once more thinking of a man I’d seen in a film, I pushed in the door and ordered a coffee with rum. There were drunks at the bar talking in very loud voices and laughing in huge bursts of noise. I had another coffee and rum and listened without listening, looked without looking. I thought about the man from the film. I thought about him so hard that he appeared in the back bar mirror, uttering words I tried to fathom from under a bridge on the banks of the Seine, to speak and yet say nothing, I think he said, to speak and yet say nothing, I tried to read his lips, that I might escape being gnawed to death. He stood then on the edge of a quay gazing into the water. When the tide is out I like to go down the steps under the pier, to inhale the mix of brine, seaweed and damp rope against the quay wall, to look at the winds of early winter and walk out onto the strand where the surf is full of shingle and kelp running after little scavenging birds. The swan that floated beyond the breaking waves seemed to be waiting to bear me with it, faraway on its journey through the Universe. On occasion I stayed out all night, from bar to cafe to bar in Pigalle, Spitalfields or downtown Cork. A clock told me it was 6 a.m. as I walked along to the South Mall, only the cleaners about, the bins being collected, the taxi ranks empty, a few night shift workers smoking as they made with haste to The Welcome Inn, early opening, buses not yet running so I would have to walk into that strange cloud of grey rising from the turgid waters of the river to suffocate us all, towards my reclusive refuge, strange, can’t get away from that old metaphor which has stayed with me longer than any other mistress, alone in my hideaway with its attic view over the river and bridges allowing me the space to survey into the distance, the approach of marauders, sit around, wait for something, always the same. I spent days in a library poring over the great philosophers, failing to fully engage with them, the more I read the more frantic I became, the greater puzzlement assailed me when I looked up at real people sitting around, some asleep over newspapers or magazines, some who did not smell too good, one snoring, one eating a bag of Tayto. The unsmiling librarians moved around with great purpose. A telephone rang behind the desk. The librarian was so calm as she spoke in a not so quiet voice, a not so appropriate voice for the general tone of a reading room. I don’t live in a flat over Montparnasse Station in Paris with a splendid panorama. I live in a little house near a quay, I have the smell of a damp rope against the quay wall, the bow of the little boat bobbing against the steps and for hours I sit watching the golden hue sent up from the field of dandelions to choreograph a dance of blazing yellow silence on the ceiling, dancing to the hidden currents of time. Edward Mc Whinney lives in Cork, Ireland. This is an extract from his work in progress, “The Diary of a Ghost.” Read more of his stories here. 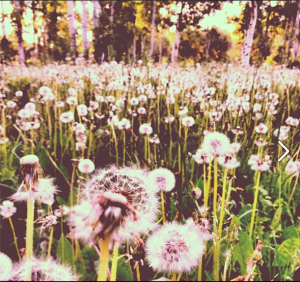 Image of dandelions by Dana Bryson.